Whilst we’re keeping note of early spring outfits, it seems to be accessories taking up Instagram realty right now. So many great shoefies, so little time. The best news? All of our favourites so far (bar a pair of Prada slingbacks and new Chanel sandals) appear to be from the high street. Though you wouldn’t know it: Nothing about these finds screams budget. The style pendulum swings from wedding guest–perfect floral pumps to crocodile-effect boots, but they all one thing in common: They won’t be in stock long. We’ve done the hard work for you, rounding up the affordable shoes creating the most buzz right now. If you need styling inspiration, take it straight from the girls who are wearing them. And there’s truly something for everyone’s budget. Put your best foot forward in our picks below. 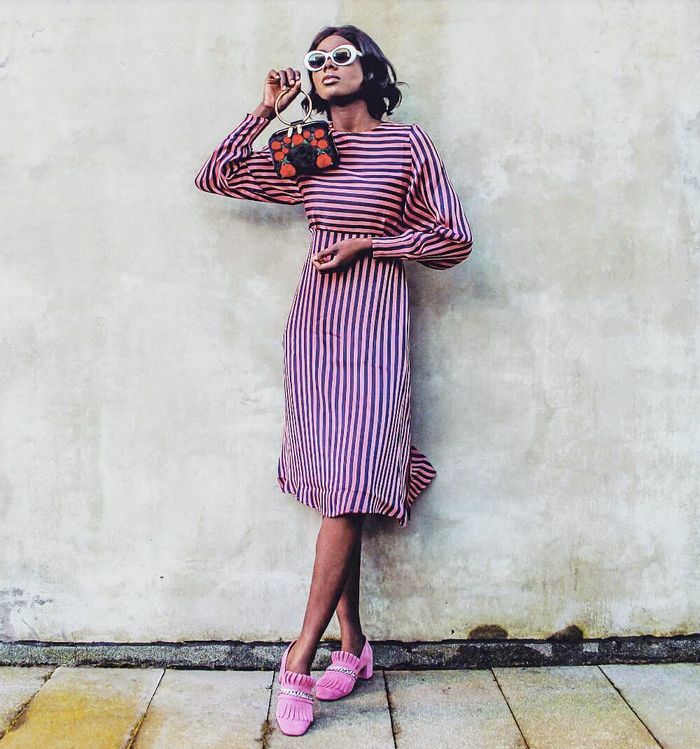 Marta from The Style Thesaurus found a seriously great pair of pink loafers without breaking the bank. Jessie Bush knows a great pair of Topshop shoes when she seems them—these £39 purple mules are close to selling out, so be quick. Luna styles Zara's jumbo-pearl flats with casual denim and a shirt. When the shoes are this good, let them be the outfit's main attraction. Lucy Williams captioned this photo "When I say these are the comfiest trainers I've ever put on my feet, I'm not lying." We better try a pair just to be sure. Hanna Stefansson goes red-to-toe in these Uterqüe statement buckle sandals. Socks and sandals never looked so good. Megan Ellaby's zingy yellow look is spring wrapped up in an outfit. Alex Stedman in Next's red boots with a leopard-print coat—a tried-and-tested combination. Karoline Dall styles her New Balance trainers with an M.i.h jumpsuit in coordinating shade of pink. Crystal of Crys Kay tried out Aldo's floral slingbacks with double denim. Anita Dundovic does double tan with her Finery boots and Gweniss bag. Brittany twins her tan jumper with these Charles & Keith pumps. Emma Hill showcases the best of the high street in her & Other Stories knit, Topshop jeans and white Dune boots. Anna shows us the chicest way to wear navy is to double up on velvet. Ellie from Slip Into Style taps into the maximalism trend, pairing these H&M boots with fringing and a logo bag.